Rumbling Bald Resort | Western North Carolina Real Estate :: DK Professionals Realty Lake Lure Inc. 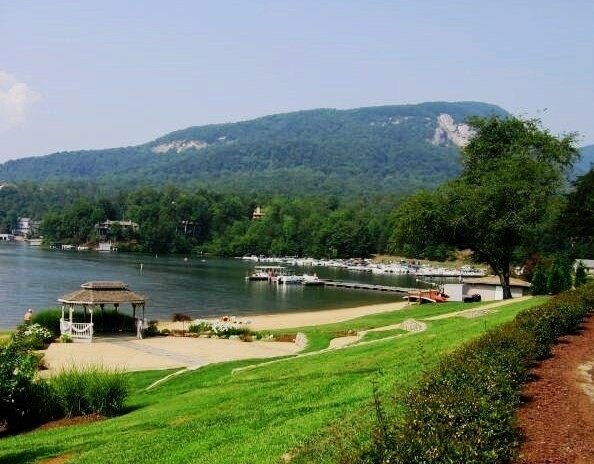 This gated resort community on the north shore of Lake Lure has two 18-hole championship golf courses, several restaurants, four lighted tennis/pickle ball courts, indoor and outdoor pools, a lazy river, miniature golf, trout streams, two private lakes, hiking/biking trails and a private marina providing rental boats and slips for property owners. There is also a nearby company providing horse rentals. There is a convenience store-with gas pumps and several restaurants. There is one interdenominational church here. There are may condominiums and townhouses in this community, as well as single-family homes. Since many of the residents are retired, some of these homes are very upscale. Some are located outside the gated community. All of the roads are paved. Membership in the Homeowners Association is a requirement. DK Professionals Realty specializes in lakefront homes, mountain homes, year round and vacation homes in the Rumbling Bald Communities. Contact an agent today so we can show you how easy it is to buy or sell a great Rumbling Bald home.